The idea of the pilgrimage conjures notions of ascetic religious duty--barefooted wanderers braving the trials of the road, the elements, and even persecution to reach their holy destinations in symbolic piety: the inward and outward travel. It appears in many ways anachronistic, a concept of a bygone era in the lens of the Western world. But in the face of these assumptions, two artists, Michael Coombs and Richard Webster, set off on pilgrimages of their own, partly secular in nature, but holding to the spirit of knowledge gained through the process of specific journeys, and the fulfilment of an important personal need. In this exhibition catalogue, Coombs and Webster feature the photographic manifestations and interpretations of their respective pilgrimages and expound upon them with essays exploring their impetuses, findings, experiences, and the wider context and implications of the pilgrimage within the framework of the 21st century West. Michael Coombs, an artist based in Northern England, explores the motivations, nature and possibilities of a secular pilgrimage: a journey not to understand the nature of or draw oneself closer to a singular god-figure, but rather to expound upon the invisible and intangible drive and desire to surpass the limits of the corporeal entity through art, through writing, through technology. Coombs' work is at once steeped in the abstract, visceral emotion brought upon by the stench of exhaust and drops of diesel on the immaculate white crystalline plains of the Bonneville Salt Flats of western Utah, as it is in the psychological and neuro-physiological reactions that drive humankind's research and ingenuity to surpass not only the seemingly established limits of physical nature, but to provide new milestones for its inheritors to supersede in a constant push forward. In his personal pilgrimage, Coombs finds mankind's divinity in the idealised American iconography of cinema, science, music, and in the notion of the endless, open highway. Richard Webster, an artist dividing his time between his studio in Devon and Northern England, embarked upon a traditional pilgrim's route along the Camino to Santiago de Compostella in Spain. Travelling on foot and public transport, he makes his journey revealing not simply a path of pure spirituality, but rather an inextricable link between the religious path and the forces of commerce, citing examples from the traditional sale of relics to today's souvenir postcards of saints and religious landmarks. Webster infuses in these movements, the mundane and necessary pilgrimage to the supermarket, where not only physical sustenance is gained, but also the perception of inward and outward identity through the mechanisms of consumerism. Between analysing the spiritual and economic impetuses of the pilgrim's nature and route, Webster touches upon personal experiences with other travellers as well, from those who are driven by personal need of spiritual fulfilment to those guided by timetables and daily quotas of kilometres travelled. 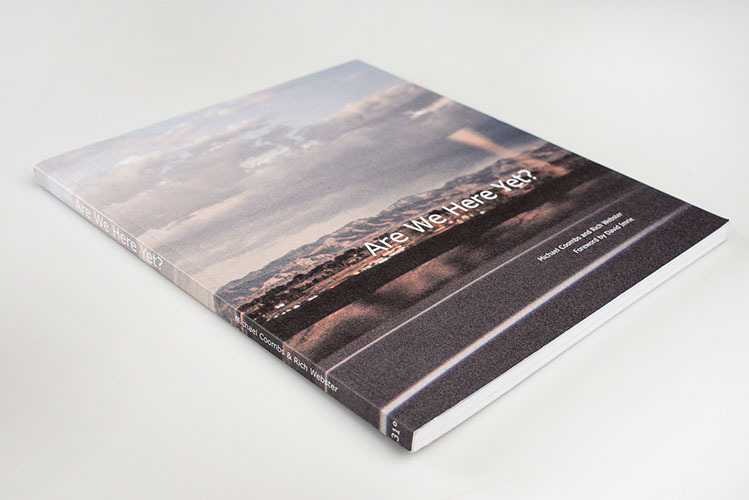 With a foreword by writer and academic, David Imrie, elucidating traditional and contemporary theories of pilgrimage and their respective implications within the foundations of Coombs' and Webster's artwork, featured throughout in full-colour photographic plates, Are We Here Yet? is the ideal companion piece to the exhibition and an important reflection upon the concept and place of the pilgrim in contemporary society. Format: 210mm x 245mm, 96 pages with 56 full colour illustrations.